How could I not love a book that I have edited? The editing process is an engagement with the author, the story, the language and all the whole universe of a work of art. Although I have not created this art, I have observed and stoked it. 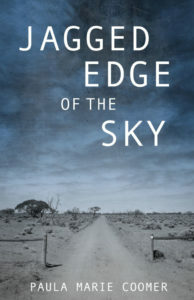 The astonishing part of editing Jagged Edge of the Sky was the opportunity to observe the generative brilliance of Paula Marie Coomer’s creative mind. This deep-keeled tale unfolds in a series of vignettes that span multiple generations on two continents. The connections aren’t instantly apparent, but long after you put the book down, the details will continue to reassemble themselves in your mind, giving you one satisfying aha! moment after another.